A common discussion I hear among seasoned network geeks and newbies alike is what is different between the ideas of tagging/labeling, tunnels, and “regular” encapsulation. Usually the newbies are trying to grok the entire concept while the old hands are trying to wing curveball exception cases at one another. While it seems nothing is absolute in networking and the astute engineer can always find a case that violates the usual rules, here are the working definitions I use which I think are right for about 98% of cases. A method of designing modular communication protocols in which logically separate functions in the network are abstracted from their underlying structures by inclusion or information hiding within higher level objects. In other words, taking a layer 4 PDU (a TCP segment, for example) and sticking a layer 3 header (the IP packet header) on the front. Then taking that layer 3 IP packet, and surrounding that with a layer 2 Ethernet header and trailer. The slightly sticky part of the encapsulation “wrapper” model comes when making the jump from layer 2 to layer 1. Layer 2 is the last one that we think of as having some structure about its PDUs. At layer 1, it’s just bits — electrical voltage levels on a conductor or light pulses in a fiber. I suppose you can still think of this as the encapsulation of the data link (layer 2) frame in the various modulation method to get it on the wire but that’s a bit of a stretch to me. Long story short, “encapsulation” is the process of taking application-layer data and moving it down the network protocol stack to get it out onto the physical medium. At the receiver, the opposite process occurs as the physical transceiver scoops up the bits from the wire and passes them back up the stack where each successive header (and trailer) is stripped off, eventually presenting the receiving application with a chunk of data. That end of the process is “decapsulation,” of course. Encapsulation is really the only of these three terms that has a pretty crisp, hard-to-find-an-exception-to definition. Tagging: Inserting extension data within an existing layer N header to be processed by a device understanding that extension. 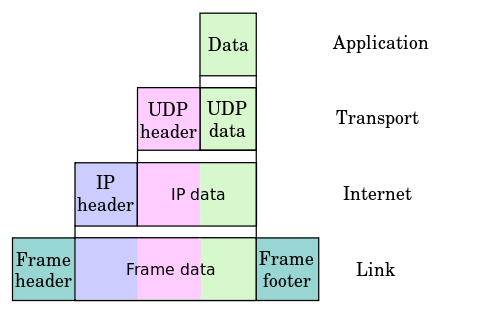 In this graphic, the top portion is a normal Ethernet frame. All the colored portions are fields of the Ethernet frame header (and the CRC/FCS is the trailer). In the bottom portion, you can see that an extra 4-byte hunk of data is jammed right in there between the source MAC address and the Ethertype field. The result is a frame that is larger than usual, and also has a piece of data that an Ethernet driver unfamiliar with 802.1Q tags will not understand and will probably discard as a corrupted frame. However, a receiver that knows about Q-tags will recognize the tag and use it to associate the frame with a VLAN. As an aside, I find it interesting that the Ethertype field is generally used to indicate the upper-layer protocol type contained in the frame, such as 0x0800 for IPv4 or 0x86DD for IPv6. But 802.1Q frames include 2 bytes that act like an Ethertype field (and exist in the same position), carrying a value of 0x8100. This is used to help signal the presence of the VLAN tag, but it means that the Ethertype field is being used to signal the content of the frame itself, not the next protocol. An interesting bending of the rules. Another “tag” use related to the 802.1Q extension is the 802.1p priority (QoS) tag. It actually uses the same tag format, but indicates a set of values, 0-7, to identify the Class of Service (COS) for that frame. So what’s a label? Well, in terms of Multi Protocol Label Switching (MPLS) which was derived from Cisco’s Tag Distribution Protocol (TDP), it’s another way of marking a packet. So is an MPLS label or a TDP tag a “tag” based on my definition above? That’s open for debate. The label isn’t shoved in the middle of a protocol header, it’s actually inserted right between the layer 2 and 3 headers. This is why MPLS is sometimes called “layer 2½”. But it does have the property of being an extension of existing protocols inserted in a way that wouldn’t be understood by a receiver not running that extension. Tunneling: Wrapping a PDU with another header from the same layer, or even a higher-layer header. OK, so that definition will cover most tunneling cases, but what is tunneling used for? Usually it’s a means to provide an abstracted logical path over an existing topology (for layer 3 protocols like IP) or to extend a topology over a path that can’t carry the underlying protocol end-to-end. However, when you take the “outer” IP header and the GRE header together, you are really getting the “layer N in layer N” effect I describe in my working definition. GRE’s function is mainly just to keep track of some of the particulars of the tunnel which the outer IP header may not need to be responsible for. As you can see in my lovely diagram above, what was originally an IP packet containing a TCP segment of HTTP traffic (as indicated by the “Protocol” value of 6) is prepended with a GRE header, and another IP header that describes the GRE packet (now with the “Protocol” value of 47). This is what allows GRE to hide the topology described by the inner IP packet within the topology provided by the outer IP packet — that’s our abstracted logical path. The network handling the GRE packet may have no awareness of the IP addresses contained by the inner IP header. The IPv4 network carries the packet based on the IPv4 header fields and when it reaches the far side of the tunnel (another dual-stacked router) that router breaks out the IPv6 packet within and interprets the IPv6 headers to continue forwarding the packet on the IPv6 side. The topology abstraction has allowed us to tunnel IPv6 across an IPv4 network. The concepts of encapsulating, tagging/labeling, and tunnels are all very much intertwined. Many, many cases can break my simple definitions. For example, I lump MPLS labels in with “tagging.” And while the MPLS label itself is functionally a tag in some ways, the features it enables, such as MPLS L2VPN or L3VPN more closely fit the definition of a tunnel. I don’t consider my classification of MPLS labels wrong, per se, but it may be tightly scoped. I like to say that someone new to networking, or even at an intermediate level should be focusing on what the “rules” are. An expert knows how and when to break them. My definitions in this article may not be perfect in every case, but I find they have helped my brain process these different concepts. Hopefully this article has helped these concepts “click” for you too. Glad it helped! Good luck in your studies.